I love the clean and fresh flavours of these Spicy Mango Rice Noodles. It’s a light and refreshing dish and just perfect for these lovely warm summer days. I love all the different flavours and textures, the beautiful sweet mango, creamy avocado, peppery radishes, crunchy coconut flakes, fresh mint and cilantro. It’s fresh and flavourful and packed with nutrients. Radishes are the optimal detox food as they support the liver, help break down fat and remove toxins from your body. Limes help to cleanse the liver and are high in vitamin C, which is important for detoxification. Fresh herbs like mint and cilantro also aid in detoxification. Rich in chlorophyll, they help clear toxins from the body. Avocado is a great source of healthy fats. These healthy fats -in the form of oleic acid- also aid in the absorption of beta-carotene, a powerful antioxidant that helps protect the body from free radical damage. Both mango and chili are rich in beta-carotene. Our body converts beta-carotene into vitamin A. We need vitamin A for healthy skin, for a strong immune system, to protect our body from infections and good vision. In a non-stick baking tray toast the coconut flakes for 2-3 minutes or until lightly browned and fragrant. Set aside to cool down. Bring water up to a boil in a large sauce pan. Add the black rice noodles and cook for 5 minutes. Drain and refresh with cold water. Set aside with a little extra virgin oil mixed right through in order to avoid sticking. In a small bowl mix all dressing ingredients together. 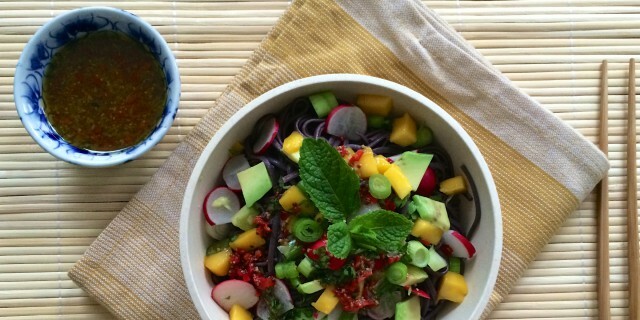 To serve, add the black rice noodles to a bowl. Top with the avocado, mango, radishes, fresh herbs and toasted coconut. Sprinkle the dressing on top.